Many surfers fear sharks. 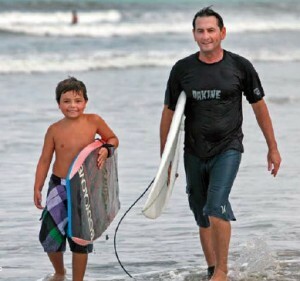 But not Mike Politowicz, 45, a seasoned surfer with 30 years of experience. “Surfing is a form of relaxation,” he says. Relaxation, that is, mixed with a little adrenalin and heart-pounding anticipation of a good ride. But on Aug. 7, 2010, as Politowicz paddled out for a wave on a Florida beach, his heart sensation was something else altogether. He began feeling sick to his stomach. He tried to paddle through it but soon realized something was terribly wrong. “It felt like someone was driving a hot spike through the middle of my chest,” says Politowicz, of Longwood, Fla. He took the next wave in and trekked a half-mile up the beach to call 911. Physicians at a local hospital confirmed he had a heart attack caused by a blood clot. Politowicz had been diagnosed with a heart blockage six years earlier by a cardiologist in the Orlando, Fla., area. After having several stents placed, he continued to lead an active lifestyle without issue. Later, he learned that a change in his medication may have caused the new clot. At a follow-up visit with his cardiologist, Politowicz was told his overall heart health had taken a turn for the worse. But he was skeptical. “I thought they were crazy,” he says. “Despite what happened, I felt like I was in the best shape of my life.” He opted for a second opinion and turned to Mayo Clinic cardiologist Brian P. Shapiro, M.D. Instead of relying on traditional diagnostic methods such as a stress test, echocardiogram and heart catheterization, Dr. Shapiro ordered a cardiac MRI (cMRI), a relatively new test designed to provide a more precise view of the heart. Thanks to the clarity of the cMRI, physicians can assess the size and function of the heart’s chambers, thickness and movement of the walls of the heart, the extent of damage caused by heart attack or heart disease, structural problems in the aorta such as aneurysms or dissections, and the buildup of plaques and blockages in the blood vessels. For Politowicz, it meant confirming the damage to the heart muscle was so severe, it was unlikely to be reversed. Dr. Shapiro also discovered that Politowicz’s arteries were again severely blocked and surgery would be needed. “The imagery helped us see the extent of damage and then make the best decisions for Mr. Politowicz,” says Dr. Shapiro. Due in part to the cost of the equipment and training requirements, the use of cMRI is generally limited to large facilities and academic medical centers. Dr. Shapiro says that although the use of cardiac MRI as a diagnostic method is not yet commonplace, he expects it will become a valued tool in the future. “With this technology, we can evaluate and provide treatment for high-risk patients sooner and hopefully prevent heart attacks,” says Dr. Shapiro. In March 2011, Politowicz successfully underwent surgery to open blocked arteries. Doctors also implanted a defibrillator due to the severity of his heart attack. Now, he’s back riding the waves. He still doesn’t worry about sharks. He says he hits the water with a renewed spirit, an appreciation for his healthier heart and the knowledge that the heart pounding he feels is all about the ride.